The Punjabi Sahit academy, Ludhiana, established in 1954 is supported by the Punjab state government and works exclusively for promotion of the Punjabi language, as does the Punjabi academy in Delhi. The Jammu and Kashmir academy of art, culture and literature in Jammu and Kashmir, India works for Punjabi and other regional languages like Urdu, Dogri, Gojri etc. Institutions in neighboring states as well as in Lahore, Pakistan also advocate for the language. ^ Bhatia, Tej (1999). "Lexican Anaphors and Pronouns in Punjabi". In Lust, Barbara; Gair, James (eds.). Lexical Anaphors and Pronouns in Selected South Asian Languages. Walter de Gruyter. p. 637. ISBN 978-3-11-014388-1. Other tonal Indo-Aryan languages include Lahnda and Western Pahari. ^ "The Art and Culture of the Diaspora | Mother Tongue: The Many Dialects of Punjabi". Sikhchic.com. Retrieved 2 February 2016. 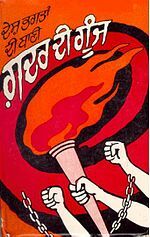 ^ "Fifty Years of Punjab Politics (1920-70)". Panjab Digital Library. Retrieved 6 January 2019. ^ "Sirsa again elected Punjabi Sahit Akademi president". Tribuneindia.com. 18 April 2016. Retrieved 13 August 2018. ^ "पंजाबी सीखने वाले छात्रों को अगले माह बटेगा एकल प्रोत्साहन राशि". M.livehindustan.com. 24 October 2016. Retrieved 13 August 2018. Shackle, Christopher (2003), "Panjabi", in Cardona, George; Jain, Dhanesh (eds. ), The Indo-Aryan Languages, Routledge, pp. 581–621, ISBN 978-0-415-77294-5 . 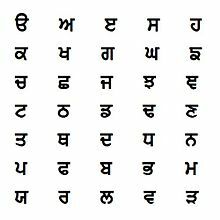 Wikimedia Commons has media related to Punjabi language.